Background: Patient involvement in the decision-making process, especially for chronically ill elderly patients, has become an important element of patient-centred primary care in many countries, including the Netherlands. This study openly explores different perspectives of patients, informal caregivers and primary care professionals on patient involvement in primary care team interactions. Methods: Sixty-four qualitative semi-structured interviews with chronically ill elderly patients, informal caregivers and primary care professionals from various disciplines. Underpinned by a phenomenology approach, this study used conventional content analysis for data analysis. 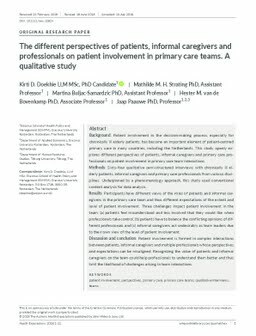 Results: Participants have different views of the roles of patients and informal caregivers in the primary care team and thus different expectations of the extent and level of patient involvement. Three challenges impact patient involvement in the team: (a) patients feel misunderstood and less involved that they would like when professionals take control, (b) patients have to balance the conflicting opinions of different professionals and (c) informal caregivers act undesirably as team leaders due to their own view of the level of patient involvement. Discussion and conclusion: Patient involvement is formed in complex interactions between patients, informal caregivers and multiple professionals whose perspectives and expectations can be misaligned. Recognizing the value of patients and informal caregivers on the team could help professionals to understand them better and thus limit the likelihood of challenges arising in team interactions.